When the sun was young and faint and the Earth was barely formed, a gigantic black hole in a distant, brilliant galaxy spat out a powerful jet of radiation. That jet contained neutrinos – subatomic particles so tiny and difficult to detect they are nicknamed "ghost particles." 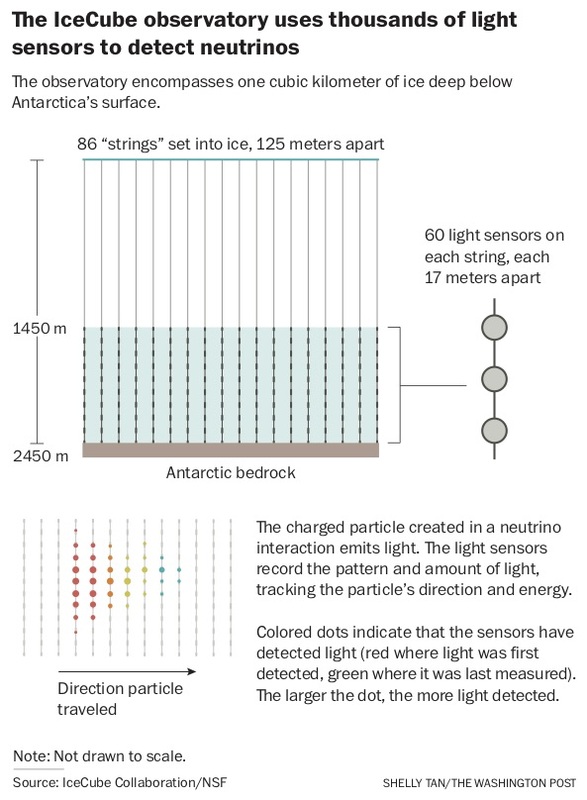 Four billion years later, at Earth's South Pole, 5,160 sensors buried more than a mile beneath the ice detected a single ghostly neutrino as it interacted with an atom. Scientists then traced the particle back to the galaxy that created it. 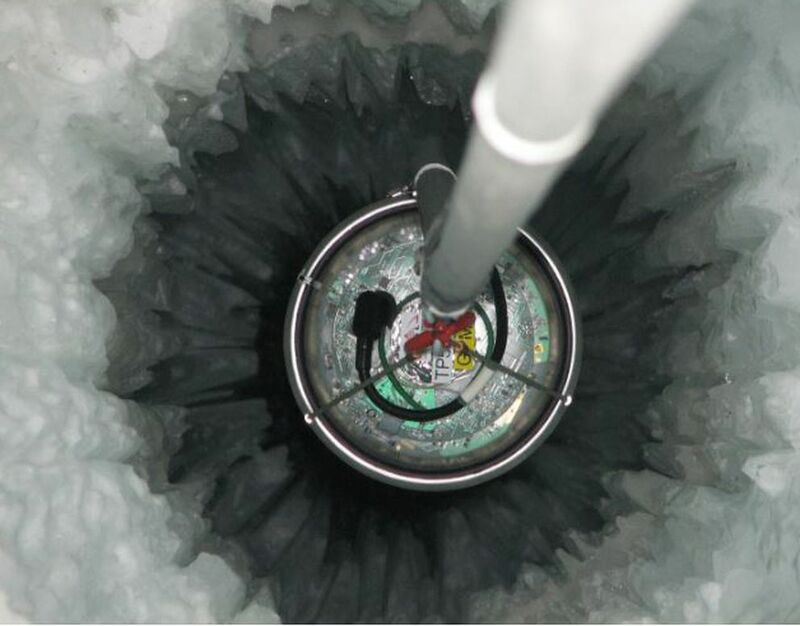 The cosmic achievement, reported Thursday by a team of more than 1,000 researchers in the journal Science, is the first time scientists have detected a high-energy neutrino and been able to pinpoint where it came from. It heralds the arrival of a new era of astronomy in which researchers can learn about the universe using neutrinos as well as ordinary light. This is physics at its most mind-boggling and extreme. Researchers compared the breakthrough to the 2017 detection of ripples in space time caused by colliding dead stars, which added gravitational waves to scientists' toolbox for observing the cosmos. Neutrinos are so small that they seldom bump into atoms so humans can't feel them. They don't shed light, so our eyes can't see them. Yet these very qualities make them invaluable for conveying information across time and space, scientists say. Light can be blocked and gravitational waves can be bent, but neutrinos are unscathed as they travel from the most violent events in the universe into a detector at the bottom of the Earth. Scientists call the kinds of signals they can detect through space, like radio waves or gravitational waves or now neutrinos, "messengers." If you're trying to understand complex and chaotic phenomena happening billions of light-years away, it's helpful to have a messenger like a neutrino: one that doesn't get lost. "They're very clean, they have simple interactions, and that means every single neutrino interaction tells you something," said Heidi Schellman, a particle physicist at Oregon State University and computing coordinator for a different neutrino detection project, the Deep Underground Neutrino Experiment, who was not involved with the new research. Neutrinos arrive on Earth at varying energy levels, which are signatures of the processes that created them. By pairing neutrino detections with light observations, Schellman said, scientists will be able to answer questions about distant cataclysms, test theories about the composition of the universe, and refine their understanding of the fundamental rules of physics. The high-energy neutrino reported Thursday was created in the fast-moving swirl of matter around a supermassive black hole at the center of the galaxy. When this black hole generates a brilliant jet of radiation, and that jet is aimed directly at Earth, scientists call the galaxy a "blazar." Subsequent analysis revealed this blazar had also produced a flare of more than a dozen neutrino events several years earlier. The new discovery, from the South Pole neutrino detector called IceCube, has also solved a mystery that stumped scientists for generations: What is the source of mysterious cosmic rays? These extremely energetic particles have been detected raining down from space since 1912, but researchers could not figure out what phenomenon could produce particles moving at such high speeds. Astroparticle physicist and IceCube spokesman Darren Grant said it's as though scientists have spent 100 years listening to thunder with their eyes closed and never known what caused the booming sound. It wasn't until they looked up and saw lightning that the spectacle finally made sense. Both sound and light – or in this case, cosmic rays and neutrinos – are coming from the same event. "That's why this is exciting," Grant said of the neutrino detection. "It's a brand new vision on what's happening in the universe." Our universe is suffused with neutrinos, so named because they are uncharged (or "neutral") and infinitesimally puny (about a millionth of the mass of an electron). They are created in nuclear reactions – at power plants, in the center of the sun, and amid even more extreme events – when protons accelerate, collide and then shatter in a shower of energetic particles. Neutrinos are the second most abundant type of particle in the universe, after photons (light particles). If you held your hand toward the sky, about a billion neutrinos from the sun would pass through it in a single second. But you wouldn't feel their presence, because these ethereal particles rarely interact with normal matter. Unless a neutrino bumps right up against another particle, it passes through matter undisturbed and undetected. And the reality is, most of what we call "matter" is just empty space. If a hydrogen atom were the size of Earth, the proton at its center would fit inside the Ohio State football stadium. The electron orbiting it would be even smaller, and a neutrino could be compared to a lone ant. Flavored specks that are found everywhere yet felt by no one; matter that seems solid but is actually mostly empty – this is the bizarre science of particle physics. It's difficult to wrap your mind around, and almost hard to believe. Yet scientists assure us they are not just making things up. Since the 1950s, when neutrinos were detected for the first time, researchers have observed low-energy versions of these ghostly particles coming from the sun and a 1987 supernova in a nearby galaxy. Maps of neutrinos emanating from the surface of the Earth have even been used to identify the sites of nuclear reactors. But high-energy neutrinos, generated only in extreme environments where protons are accelerated to astonishing speeds, have been challenging to pin down. To be detected, a neutrino had to form long ago in a far away cataclysm, travel across intergalactic space, fly through our galaxy, enter our solar system, sail on to Earth, and then happen to interact with a particle minding its own business in the ice below the South Pole. And, in a process that seems just as improbable, in the time since the neutrino left its source 4 billion years ago, life on Earth had to arise, expand, and evolve to the point that a few enterprising Homo sapiens were willing to go to the extreme effort of detecting it. "It's crazy," said Chad Finley, an astroparticle physicist at Stockholm University who spent 10 years coordinating the effort to pinpoint neutrinos' origins for the IceCube team. "These are particles that seldom interact with anything. That has to be the unluckiest neutrino ever." On the other hand, he mused, he and his colleagues are some pretty lucky humans. The result was a grid array of sensors spread across a cubic kilometer of glacier and capable of catching a ghost. 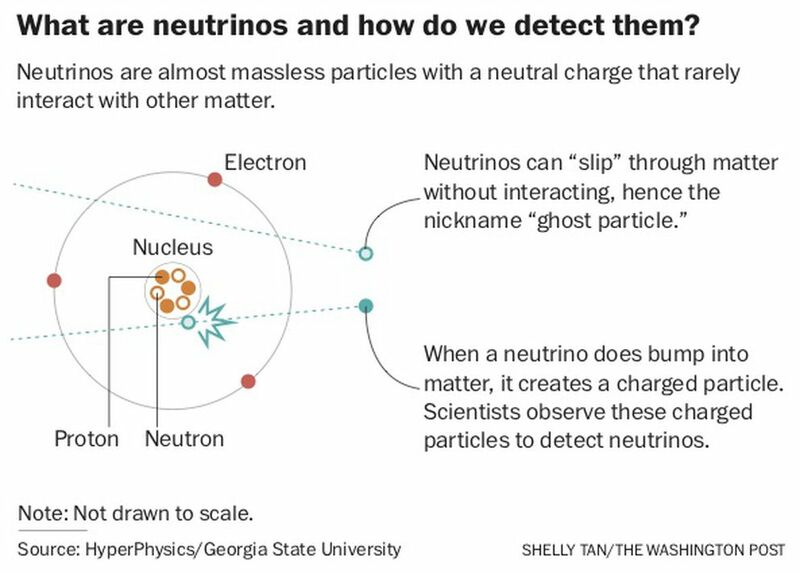 The sensors record the energy level and direction of the flash of light emitted by the charged particle created when a neutrino crashes into other matter. From that information, scientists can extrapolate the energy level of the neutrino and where it came from. Since the observatory was completed in 2010, IceCube scientists have detected dozens of high-energy neutrinos coming from outside the solar system. But they were never able to connect those particles with a source that could be observed by conventional telescopes. Establishing such a connection was a "holy grail of the field," Finley said, in large part because of the link between neutrinos and the enigma of cosmic rays. These are extremely energetic protons and atomic nuclei moving through space at almost the speed of light. They're considered one of the threats to humans on a potential mission to Mars: During the months-long journey through space, cosmic rays would damage the cells of astronauts and could cause radiation sickness. But unlike neutrinos, cosmic rays have a charge, which means their path can be deflected by magnetic fields. This allows Earth's magnetic field to protect us from these powerful particles, but it also makes it impossible for scientists to figure out where the particles come from. Extensive research suggests that whatever process accelerates protons to such speeds also generates high-energy neutrinos. So if IceCube could figure out where neutrinos were coming from – a task made simpler by the fact that neutrinos are such dependable "messengers" – they'd know the source of cosmic rays as well. "Neutrinos are the smoking gun," Finley said. On Sept. 22, an alert went out to the international astronomy community: IceCube had seen the signature of a muon neutrino coming from just above the right shoulder of the constellation Orion in the night sky. Swiftly, scores of scientists began pointing their telescopes in that direction, staring at the right region of the universe in every wavelength of the electromagnetic spectrum. Researchers using NASA's Fermi space telescope saw a burst of gamma rays coming from the presumed source. Gamma rays are associated with the particle acceleration that produces both neutrinos and cosmic rays. Other observatories saw flares of X-rays, radio waves and visible light. Taken together, these observations revealed a blazar – a giant elliptical galaxy with a spinning supermassive black hole at its core. As a blazar spins, twin jets of light and charged particles – one of which is aimed toward Earth – spurt from its poles. The blazar was given the catchy name "TXS 0506+056" – the first known source of a high-energy neutrino, and a possible answer to the century-old cosmic ray mystery. As a matter of due diligence, Finley suggested that the IceCube team go back through their old data to examine whether any other neutrinos had come from the same direction. He didn't expect to find anything – neutrinos react so rarely that finding more from a single source would be like lightning striking twice in the same spot. So he was shocked to discover that IceCube had recorded more than a dozen neutrino events from what they now knew was the same blazar between late 2014 and early 2015. It was so improbable that Finley found himself repeating the words uttered by Isidor Isaac Rabi, a Nobel prize-winning U.S. physicist, when he discovered the muon: "Who ordered that?" Of all these "senses," neutrinos are in some ways the most reliable. High-energy light from distant sources rarely makes it to Earth, because photons are so reactive they get lost along the way. Neutrinos, on the other hand, will travel in a straight line right from their origin point to a detector. "It's an absolutely beautiful messenger," Grant said. Neutrinos' ghostly quality also means they can be used to probe celestial objects light can't penetrate. Schellman pointed out that astronomers using regular telescopes can't see beneath the surface of the sun, but 30 years of observations of the low-energy neutrinos that emanate from our star's center have allowed scientists to peer into its core. By looking at their energy levels, researchers could understand the fusion process that creates the neutrinos and generates the sun's energy. This research also revealed that it takes 100,000 years for energy at the center of the sun to make it to the surface, "which means the sun is going to keep working for at least 100,000 years," Schellman said. So that's one disaster Earthlings don't have to worry about. The neutrinos detected by IceCube are millions of times more energetic than those coming from the sun, but they offer the same kinds of insights into the intense environments from which the particles emanate. The telescopes looking at TXS 0506+056 could only capture what happened on the surface of the blazar; the neutrinos carry signatures of the processes at its very center. It's in these extreme settings that the laws of nature are stretched to their limits. What neutrinos reveal about the acceleration of charged particles and the voracious behavior of black holes could help scientists refine the rules of physics – or rethink them. And there are even more energetic neutrinos out there – ones that make the powerful IceCube particles look practically wimpy. To Schellman, this suggests that other, even more chaotic and cataclysmic, sources of neutrinos are still waiting to be found. "There are things we don't even know about yet," she said. "This is just the start."